FURO is the representative interactive robot capable of providing multiple services by reading users’ intentions in different situations. This man-like robot perceives users’ movement, face and voice, and then conveys the matched dialogue, facial expression, movement, and necessary information. They can freely move with wheels, switch directions, and change facial expressions in different situations. It dances to the music, has tears in their eyes when the visitors are about to leave, and its mouth and eyebrows move as they speak. At hotels or shopping malls, FURO provides information services, automatically recognizing the people around it. When visitors come closer, FURO approaches them, nod in greeting, and explain the main services in a speaking voice while showing the related images on the display screen it holds. At restaurants, FURO can replace waiters. Customers can select the menu on its display screen and swipe their card on the card readers. When the robot prints out receipts from the built-in printing device, the order will automatically be delivered to the kitchen. At exhibitions or museums, FURO can provide multiple information services in 30 different languages to foreign visitors. Although capable of performing a multitude of tasks, its management is as simple as smartphones. The Internet-based software can be remotely monitored and maintained without the hassle of going to maintenance centers. Users can also customize their software by adding or designing their own application. 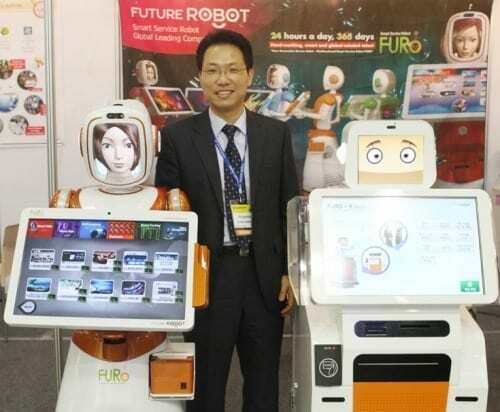 Being presented at CeBIT in March this year, FURO was the first Korean robot unveiled in the European market. This man-like robot fascinated European buyers with novel and innovative ideas. “It was very exciting for us to show our technologies and also gain more innovative ideas from them. One buyer from Brazil who ordered over 100 FUROs came up with new business model – mobile (moving) advertisements. As FURO moves around in airports or exhibitions, they said, the back screens which are remotely operated can be utilized for advertisements while the front screen performs ordinary information services,” Song said. Thanks to the successful debut in the European market, FURO was again invited to Internationale Funkausstellung (IFA), one of the world’s largest trade shows for consumer electronics and home appliances this September. “At the IFA Tech Watch Forum, where noteworthy new technologies are presented, FURO was deployed to provide information service for the participants. For these participations, it was a unique idea that a robot can replace human ushers in the exhibition, and some even hoped to see them at next year’s IFA saying that the venue is so expansive that visitors can easily get lost and pointing out the difficulty of deploying attendants at every corner of the exhibition.” Following the participation at the international exhibitions, demands from overseas countries significantly rose. The company has already supplied to France, Japan, China and Brazil and are negotiating with additional 20 countries.